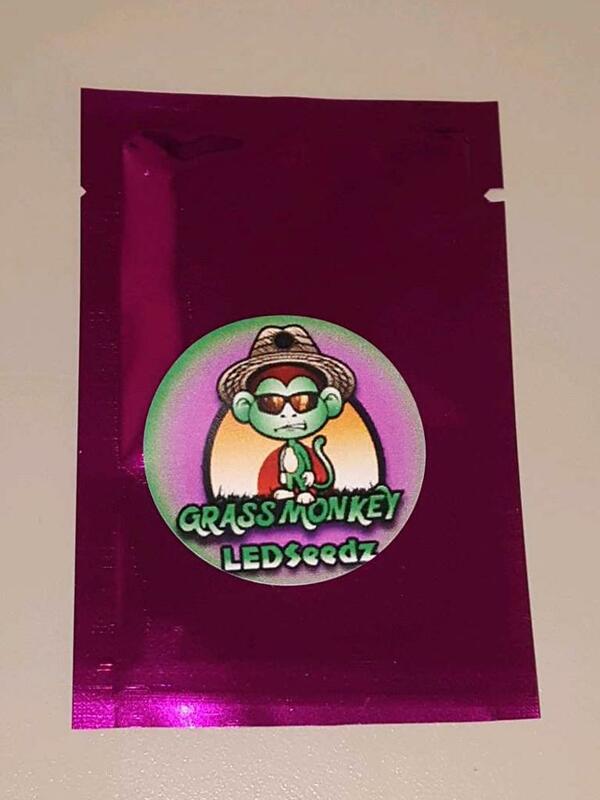 This thread will be to document the testing of Grass Monkey F2 by @LED_Seedz with @G-paS, @Jellypowered, @toastyjakes, @ReikoX, and @Roux. Get your favorite smoke and pull up a chair for the show. Again, thanks to @LED_Seedz for the opportunity and here's to hoping for some amazing plants over the next few months! I'm stoked for you guys! Got my chair over here in the haze. Cool. I'll find me a limb to swing from and watch. You know this a new channel on my viewer. I can't wait to get my purple bag. It is somewhere on 8 mile now. I took a D-Nail Detour. Scratching out a dry place to sit and watch this one! What a talented cast of blades! Lets get this party started shall we? Growing Medium: Virgin Royal Gold Tupur. These will be their final homes, as the roots will air prune themselves It should limit the overall plant size. Training will likely be required to maintain optimum space utilization. Lighting: Custom SolStrip Array, Dubbed "Jellysol" running at 300w until Flower. This will be the light for the whole grow. 3500K Color Temp. Space Temp and RH: 82° F and 42% RH. Nutes and Amount Used: Media was pre-charged with .9 EC/495 PPM Greenleaf Nutrients MegaCrop. Approx 21oz of the solution was used to soak each pot. Slight runoff in the drip trays, maybe 1/8th inch worth. I'm super stoked to be able to take place in this momentous test grow! Let me know if I should add any more data. I'm stoked for you brother, These are very select genetics my friend.... as one of the original testers of this fine product brought to market by @LED_Seedz, I have had close to 1.5 years of satisfaction from a very frosty / potent / tasty stable strain, that is good meds and great smoke. The ease of cloning and growing is what impressed me the most, it is an aggressive cloner and flat finishes perfectly every time at 56 days. I have grown / smoked and tested my fair share of weed over the years and I can count the stand out strains on both of my hands...this one was added immediately after the first smoke. The initial test grow was phenomenal / easy and it had cloned very quickly both from vegetative state and flowering, the re-veg and the veg clone both came out the same in flower further cementing the stability of this clone...... so when you see the stars line up like that then you know this cut belongs alongside SFV / Romulan / Blueberry/ Kush and OG and the other legendary cuts imho. I'll have it forever if possible....don't want to loose this specific cut. First off let me say wow I am honored to be growing this strain Grass Monkey. Thank you PJ from @LED_Seedz. I am looking forward to working with each and every one of the grow team and seeing every ones progress as we begin our adventure together. The rockwool cubes are soaking in RO water and the 6 lucky seeds chosen are having a pool party. Time waits for no man, 8 seeds will soak overnight in 35 ml/gal Ful-power. 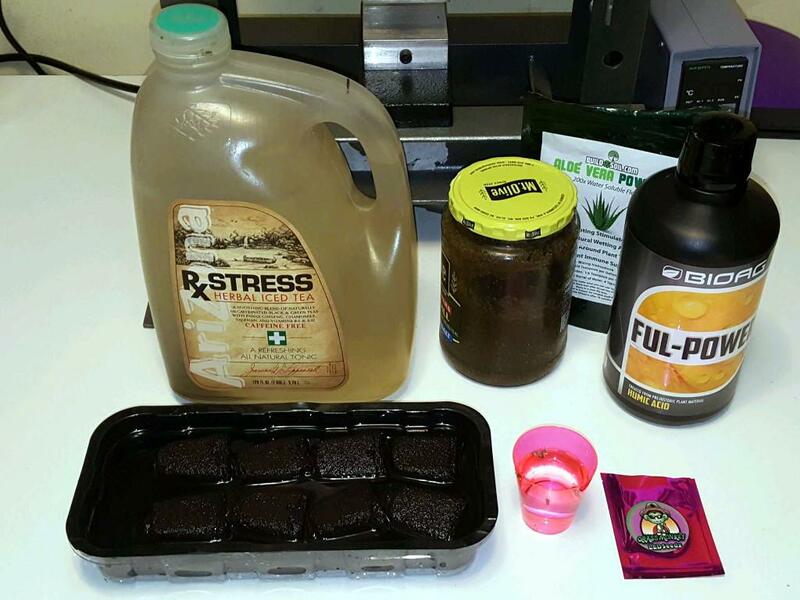 8 rooter pugs are soaking in 35 ml/gal, 2 tsp/gal kelp and 1/4 tsp/gal 200X aloe powder. 8 gender tests were ordered from Steep Hill. Once they get their second set of new leaves, the I'll send off the samples for the gender test. Male's will be discarded, and the remaining will get transplanted into their final 2-gallon fabric pots. Once they are big enough, clones will be taken, and they will be flowered. They will be grown in half of my work bench. The dimensions of the cab are n my 30"x30"x30". They will veg under 120-watts of SolStrips. Typically I flower six plants vertically around a 150-watt CMH bulb, but I plan to upgrade the lighting to 27000K SolStrips x 6 @ up to 250-watts (dimmed). Wow!! I am really excited for this testing grow guys. I wish I could test with you as well some day, but I gues its wouldnt be possible in europe. Maybe some day I wish all the luck and great results. This genetics with solstrips is killing combination!! I am really looking forward to see different growing medium and the differences between them. After reading your post I am in awe. Should I use Happy Frog to start or make something better. I added Canadian Sphangum Peat Moss to the HF in one pot last time and the pot is much better at holding water. Seeds are showing out for delivery, will see. Happy frog is very HOT nute wise out the bag. Not to mention every bag comes with free fungus gnats lol. I used HF for one grow and I didn't feel that it had enough drainage so I added about 30% by volume in pearlite. I start seeds in 70/30 happy frog to perlite. Quit monkeying around now guys.